What can the bishops of the United States do to serve the ecumenical journey? The question is a deceptively simple one. Finding an answer requires looking at the goal of ecumenism, as understood by both the Catholic Church and the World Council of Churches. It has been understood traditionally as full, visible unity in faith, sacramental life and ministry, manifested above all in eucharistic fellowship and with the intent of glorifying God and bringing the world to belief in Jesus Christ. The Second Vatican Council’s “Decree on Ecumenism” (1964) puts it thus: “Little by little, as the obstacles to perfect ecclesiastical communion are overcome, all Christians will be gathered, in a common celebration of the Eucharist, into the unity of the one and only Church, which Christ bestowed on his Church from the beginning” (No. 4). Now, when this goal has been challenged by recent developments in the Anglican Communion and in the Evangelical Lutheran Church in America, and when the ecumenical landscape is shifting before our eyes, it is necessary to shape the ecumenical future now, rather than wait and react passively. Put bluntly, the Catholic Church can pay now or pay later. Paying later always costs more. In planning the path our church must follow, we Catholics must consider both the ecumenical present and a proposal for the ecumenical future. The ecumenical present and future call for fuller, deeper analysis than I can offer here, but my hope is that these open-ended, personal reflections can spark a discussion among the bishops and help them discern how best to advance the unity of the church in the years to come. The ecumenical movement has entered a new phase, passing from the enthusiasm of the decade or so immediately after the Second Vatican Council to the maturity and sobriety of recent years. The opening words of Dante’s Inferno come to mind: “In the middle of the journey of our life I came to myself within a dark wood where the straight way was lost.” One might speak of ecumenism having reached a midlife crisis that can lead either to weariness and resignation or to recommitment and renewal. Neither path is easy, but only one leads to life. The ecumenical paradox for Catholics is that we are witnessing at once increasing distance and increasing friendship. On the one hand, the prospect of full visible unity with other Christian communities—apart from the Orthodox and other Eastern churches—is in painful, visible ways more distant than it was at the conclusion of Vatican II in 1965; the Church of England’s decision in 2008 to ordain women to the episcopate, for instance, was almost certainly a final blow to the realization in history of full, visible unity between Catholicism and the Anglican Communion. 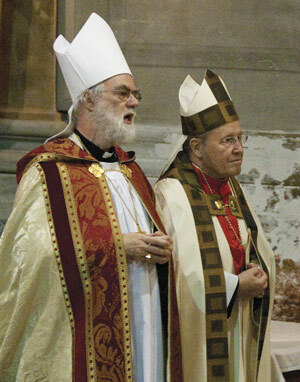 Likewise, the achievements of recent decades are evident: the Lutheran-Catholic-Methodist Joint Declaration on the Doctrine of Justification; the World Council of Churches’ paper Baptism, Eucharist, and Ministry; the resumption and remarkable progress of international dialogue with the Orthodox churches; closer bonds between Catholics and evangelicals; and Catholic documents like “Unitatis Redintegratio” and “Ut Unum Sint,” to name only a few. Seen in conjunction with these lights and shadows, Benedict XVI’s pontificate represents a kind of ecumenical Rorschach test. Many see the pope as a hindrance to ecumenism, pointing to “Dominus Iesus” (2000), recent statements by the Congregation for the Doctrine of the Faith on the nature of the church, and “Anglicanorum Coetibus,” as signs of a shrinking back from the vision of Vatican II in favor of a defensive triumphalism. Others, of whom I am one, argue that the pope sees the primary contemporary ecumenical questions to be not ecclesial but cultural, philosophical, spiritual and, most radically, Christological. Holding that there is an ongoing realignment not only among, but also within Christian communities, he has centered his energies on causes that are transconfessional: a call for Christian communities to witness together to longstanding moral and cultural values in a time of upheaval, particularly in the West; insistence on the liberating and unitive power of truth over that liberalism of religion as subjective taste decried by John Henry Newman upon his creation as a cardinal; and, above all, a renewed ecumenism and evangelism centered on a personal encounter with the risen Christ. One sees this Christocentric commitment in the time he has devoted as pope to completing the two volumes of Jesus of Nazareth, in his celebration of the Year of St. Paul and even in the Congregation for the Doctrine of the Faith’s shift of activity from the ecclesiological and ethical disputes of the 1970s and 1980s to the Christological debates of the 1990s and the 2000s. One need only recall Pope Benedict’s insistence, in the introduction to “Deus Caritas Est,” that “being Christian is not the result of an ethical choice or a lofty idea, but the encounter with an event, a person, which gives life a new horizon and a decisive direction.” So, too, are ethics and doctrine ecumenically central but not primary. The encounter with the person of Christ is the primary ecumenical reality. It gives direction to still-necessary ethical and doctrinal dialogues. One might speak of the “audacity of Pope” in fostering this recentering on the person of Christ, both within Catholicism and in Christianity as a whole. Given this ecumenical context, how can the bishops best serve the ecumenical journey in the future? My suggestions correspond to two questions: What shall we do, and who will be our partners? The primary ecumenical task should be a renewed emphasis on the primacy of prayer. Spiritual ecumenism is, in the words of Vatican II, the “soul” of ecumenism, for it alone enables deep and lasting conversion and communion. And at the heart of prayer is an encounter with the person of Jesus Christ. It is telling that Pope Benedict devoted his homily for the closing of the 2010 Week of Prayer for Christian Unity to St. Paul’s encounter with the risen Lord, an encounter that gave rise to Paul’s evangelizing mission. Perhaps a “Petrine” ecumenism, centered on matters of authority and office, needs to be complemented by an ecumenism attentive to the Pauline (evangelical), Johannine (mystical-sacramental) and Marian (contemplative-receptive) dimensions of ecclesial life. Dialogue with other Christians must always be preceded and sustained by a dialogue with Christ. Second, such ecumenical prayer might flourish in a monastic setting of hospitality. The Bridgefolk project of Catholics and Mennonites meets regularly at St. John’s Abbey in Minnesota for prayer and theological dialogue. The Catholic and Lutheran bishops of Minnesota have for over 30 years met annually for a two-day retreat. These experiences of prayer open up relationships and insights that would be difficult, even impossible, to realize in other ecumenical contexts. Third, a recommitment to spiritual ecumenism will help deepen theological dialogue. This would not be a retreat from theological reflection, which remains essential. Many of our bilateral and multilateral dialogues have accomplished great good; the Joint Declaration on Justification, for instance, was made possible in large part by decades of work by the U.S. Lutheran-Catholic dialogue. A call to prayer is not a flight into escapism or mindless sentimentality, but rather the wellspring of the deepest, most fruitful theological inquiry. Fourth, Cardinal Kasper’s suggestion in February 2010 at a symposium, titled “Harvesting the Fruits,” for an ecumenical catechism points to an erosion of classical commitments among some in the Christian churches. His comments echo those of Father Tillard on the “fragmentation of faith in Christ” as well as those he himself made during the Week of Prayer for Christian Unity in 2005. Cardinal Kasper notes that an “ecumenism of basics” is needed to ensure that ecumenical dialogue builds on the solid ground of Scripture and tradition. One consequence for the bishops’ conference might be building relationships and dialogues with Christians across confessional boundaries who adhere to what might be called a Nicene Christianity. Who Will Be Our Partners? One emerging area of ecumenical engagement is the formation of new partnerships on common ethical and social witness. These involve evangelicals, Pentecostals and, most recently, Mormons (acknowledging that their identity as Christians is disputed). Such common witness is increasingly necessary, even if great care must be taken to avoid reducing the Gospel to moralism and the churches to political agents. Second, broader outreach and resources should be directed to evangelicals and Pentecostals. If modern Catholic ecumenism has focused largely on the “East” and the “West,” it must now take greater account of the “South,” both internationally and domestically. Evangelical and Pentecostal communities are the demographic future (and present) of institutional Protestantism. The Catholic Church must refocus its ecumenical efforts accordingly, even if such communities are more dispersed and decentralized than those of their mainline brothers and sisters. Finally, we Catholics need to commit ourselves to and join with other Christian communities in a common evangelical witness. In the United States, the spiritual lives of children and young adults—Christian or not—are marked by what the sociologist Christian Smith of the University of Notre Dame has called “moralistic therapeutic deism.” This is a post-confessional, post-Christian framework that eschews most traditional religious beliefs, practices and languages in favor of a generic religiosity centered on doing good (moralism), feeling good about oneself (therapy) and relating to a God who solves problems but is otherwise distant and uninvolved in one’s life (deism). Smith believes that such a belief system is parasitic (it cannot stand alone but draws life from already existing religious communities) and colonizing (it tends to take over such communities and reorient their beliefs and practices). His latest book, Souls in Transition: The Religious and Spiritual Lives of Emerging Adults, confirms that these youths and young adults are holding onto moralistic therapeutic deism as they move into their mid-20s. ...where the Churches’ quarrels could look like family wrangles which did not endanger allegiance to Christ or to Christianity as such. Nations, societies, sometimes individuals, could pass from one Christian group to another Christian group which was judged more faithful. But today people are going elsewhere. They are searching elsewhere. They are making attachments elsewhere. It is no longer just a matter of re-uniting or gathering together Christ’s family. It is a matter of saving this family, hauling it out of the sand where it is stuck, for its own good and the good of the humanity which needs to be gathered together…. It cannot be doubted that the urgent need to proclaim Christ together should become the chief purpose of the baptized, hic et nunc. It is a question of double or nothing, life or death. Thank you for this very insightful article. I am in the process of converting to Roman Catholicism after 26 years in the tradition of the Anglican Communion. The Lord's leading in this regard has, of course, had many facets. However, the one that resonates with your article is the importance of securing the deposit of faith as it was handed down from the Apostles. The Catholic Church has been given the foundational role in this responsibility. The other mainline denominations are in the process of fracturing over the acceptance of various secular ideas that proponents see as improvements or progress but that actually remove us further from the awareness of objective Truth in the form of Jesus Christ as God among us. There are similar intellectual and scholarly arguments within Catholicism but they do not have the same ability to change the accepted teaching handed down by the Apostolic community. Consequently, the greatest gift the RC church can offer in its outreach of ecumenism is the gift of the authentic Gospel which is literally life giving in a way that moral teaching alone can never be. Kudos to Christopher Ruddy for focusing on the encounter with Christ as the true meeting place for ecumenism. Despite too many insular declarations from some hierarchs the unity between the "separated brethren" and Catholics is at an all time high. Spirit shows that he is really thinking with the church; the entire body of Christ comprised of all Christians. Hopefully, people who hold on to power positions will relent and let the Spirit guide the church. Excellent piece and good comments. The "management' attitude of Hierarchs and the concern for structure that dominates the US culture in Government, Corporation and Church c an so easily obscure the key offered by Professor Ruddy which flows from the Gospel. Who do people say I am - You are the CHRIST - Son of the Living Godl The Magnificat and the Beatitudes and Mathew 25 point us to that fundamental fact; we subject our pride, personal and structured to find The IMAGE of GOD in humble service of the HUMAN person and that is "CHURCH" - Jesus to Paul "Why are you persecuting Me" The apostles jockeying for power - answer- drink this cuP"Do it My Way" - humility, crucifying self. Have (Jesus")Mind. That METONOIA _"turn around" is not easy. As long as our bishops have honorific titles E mi nence and Excellency and live a lifestyle for most of them that perpetuates that medieval nobility status we have a sad symbol and major obstacle to being Christ-ianized. The secular ;eaders "Lord it over their subjects, You must be servan ts Jesus told the first "College of Bishops' - we call them My Lord, "Monsignore" and that is how too much of the pastoral life of the Church is conducted. The alienation between the hierarchy and the ordinary parish priests caused by the Dallas Charter aggravated a separation that was studied and proven decades before. Clean the sheep pen, starting with the Chief Shepherds and notice the real work of Christ being conducted in every neighborhood and small town as pastors and people work to feed, clothe and house THE BODY OF CHRIST in the poor and powerless here and overseas. Those inter-church pastors and lay leaders are the real Eminences and Excellencies in fact and in ecumenical practice. "Putting down the mighty from their thrones" as in the Magnificat prays in prophetic hope will come in time. DISENGENOUS AND HYPOCRITICAL AT THE LEAST.. ANY TAKERS?? If many Latinos have below median incomes and live in the inner city, they likely don't have the resources to pay the tuition and associated costs to attend the catholic schools there, which coincidentally are having a hard time financially staying open. If those, at least those legally present, were provided vouchers to choose the school best for their children, I would bet the number of Latinos present in Catholic schools would greatly increase. I may have missed it, but do the editors of America have a position on the voucher question for inner city children? If so, all would benefit from seeing it stated or restated in an editorial. Back to the subject of the essay, Mr. Ruddy's paragraph quoting the intro to Benedict's Deus Caritas Est is magnificent, one of the most conciliatory, ecumenical, and promising points I have seen made in America, from my limited viewpoint at least, and so clearly stated. Dr. Ruddy may be correct when he writes that "the Church of England's decision in 2008 to ordain women to the episcopate . . . was almost certainly a final blow to the realization in history of full, visible unity between Catholicism and the Anglican Communion." But that is a sad, unfortunate commentary on the Catholic leadership, not on the Anglican community. I find it impossible to believe that Jesus would deny women ordination to the priesthood or to the episcopate if He were physically present; my hope is that the Holy Spirit will show pope and bishops that they must "[scrutinize] the signs of the times" and [interpret] them in the light of the Gospel." (from the "Pastoral Constitution on the Church in the Modern World," which Professor Ruddy quotes at the end of his article). This article also appeared in print, under the headline "Our Ecumenical Future," in the November 8, 2010 issue. Christopher Ruddy is an associate professor of systematic theology in the School of Theology and Religious Studies at The Catholic University of America in Washington, D.C.